Legal, recreational marijuana crept closer to Rhode Island, with the weekend opening of Northeast Alternatives to the general public. The medical marijuana dispensary began selling product to anyone 21 and older on Sunday. The store is less than a minute from the Rhode Island border, where recreational marijuana is not legal. 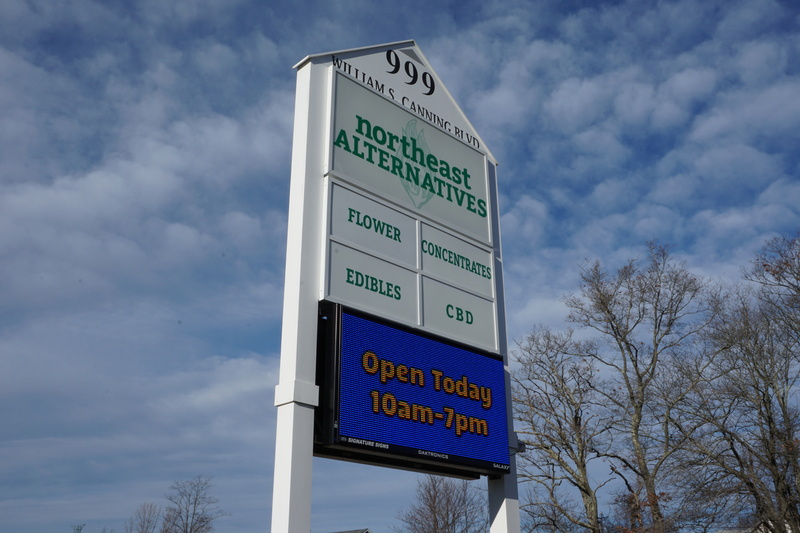 The sign for Tiverton is visible from the sidewalk in front of Northeast Alternatives, where dozens of people stood in whipping rain to be among the first recreational customers. Despite brisk business, co-owner Rich Rosier said the company is working to avoid the headline-grabbing traffic of Massachusetts’ other recreational pot shops. Once summoned, customers can purchase a variety of flower, that’s the dried plant, pre-rolled joints, concentrates, or vape cartridges. Business was brisk on opening day. Customers were required to give their phone number upon entry, and if area codes or car license plates are any indication, the store is already a hit with Rhode Islanders. Rhode Island Governor Gina Raimondo proposed legalizing recreational marijuana in her 2020 state budget proposal.